City Cemetery is a historian’s cemetery! 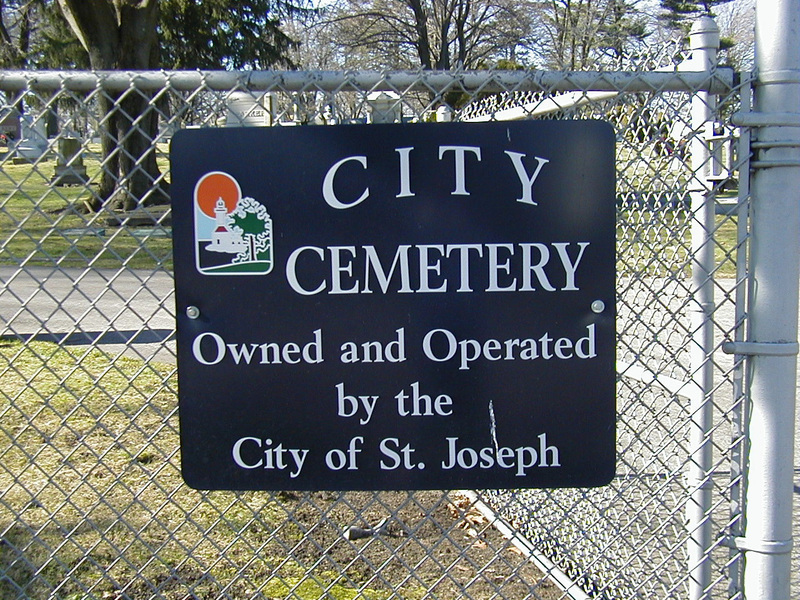 Originally controlled by St. Joseph Township, City Cemetery was purchased in May of 1849. Some of St. Joseph’s pioneer citizens can be found situated on a hilly knoll under the shade of many trees, including St. Joseph’s first settler and Lieutenant Governor, Major Calvin Britain, Poet and Humorist, Ben King and some familiar family names, such as, Langley, Schneck, Neuchterlein, Kingsley, Mollhagen, Tiscornia, Napier, and Wells. Besides the noteworthy, there also lay many of St. Joseph’s military veterans, beginning with the Civil War. Augustus W. Chapman rests in City Cemetery after he died during the Civil War but his name will be remembered best as Augustus W. Chapman Post 21 of the Grand Army of the Republic. The Chapman Post later built a brick meeting hall on Lake Boulevard, the current home of the “Curious Kids Museum”. From “The History of Berrien and Van Buren Counties, Michigan”, published by D. W. Ensign and Company in 1880:Appearing on the St. Joseph City Plat Map of 1903, City Cemetery bordered the W. S. Dunbar property to the North, H. A. Wilson property to the East, J. K. Heartt property to the South and the John Murphy property to the West. Construction of the Mausoleum started on September 15, 1913 and the building was dedicated on August 16, 1914. The cost was $30,000 and is in the Greek Renaissance Temple style with a cruciform or cross-shaped floor plan. It was constructed of sandstone blocks on the outside and the interior walls and floors were finished with white marble. Engraved into the walls are various scriptural passages and a motif of the down turned torch symbolizes mortality. The wreaths used in the stain glass doors represent memory. in the better way of caring for the Beloved Dead. both living and dead this tablet is lovingly inscribed. In the summer of 1981, several members of the Berrien County Genealogical Society transcribed over 2,000 headstones in City Cemetery, including the Mausoleum. Taking on this monumental task were Macille Kline, Thelma Troost, Barbara Troost, Marcella Kelly, Marge Pearson, Anne Stobbe, and Edith Zuppann. Not only was each stone transcribed, but also with the natural artistic ability of Macille Kline, much of the artwork and designs featured on the stones were replicated on paper. The real history of the cemetery came out during this time period and even became the topic of several news articles in The Herald-Palladium. During this time, a stone was found with the letters, “B, S, M, A” with the date obliterated. The Cemetery Superintendent at the time, Robert Ketlehut remembered hearing stories from his father, who was the Cemetery Superintendent for 45 years previous to him. His father remembered the date on this stone to be 1822 and that it belonged to a young girl. Robert Ketlehut has since passed away so this is the only clue available as to the identity of this stone. Twenty years later in the summer of 2001, members of the Berrien County Genealogical Society and the St. Joseph Lions Club transcribed and mapped out City Cemetery with the assistance of Willie Fryer, current Superintendent of Cemeteries for the City of St. Joseph. Unfortunately, the “B, S, M, A” stone was not found in the 2001 walkthrough. The oldest stones recorded that were legible in 1981 were those of the Lillibridge children, William and Jane. William Lillibridge died in 1839 and his sister, Jane died in 1840. The stones were beautiful with a carving of an urn filled with “weeping branches”. The branches swept downward and touched the bottom, thus back to earth. According to early research at the Michigan State Library, it is believed that William and Jane were the children of Dr. Lowell and Ruth Lillibridge, who came to St. Joseph from Ohio. Dr. Lillibridge established his practice in St. Joseph and after many years in St. Joseph, the family relocated to California. Both William and Jane rest peacefully among the many others that have passed after them. Unfortunately, these stones could not be found during the 2001 walkthrough. “Here’s a sigh for the Chicora, for the broken, sad Chicora. Here’s a tear for those who followed her beneath the tossing wave. It has been said that Mrs. Pearl spoke of an eerie premonition that came over her regarding the sinking of Chicora. A dog owned by Joseph Pearl became very uneasy the day the boat left Milwaukee for St. Joseph. The dog would go from one window to another, and then sit up in the middle of the room and howl! Although May Dempster Pearl remarried twice, first to J. W. Mullen and then to Joseph Burkhard, it was apparent that she still carried the legacy of her late husband, Joseph Pearl. Her will requested that a small, designated parcel be buried with her and friends suspected that it was a piece of the Chicora wreckage. Another tragedy felt in St. Joseph occurred on September 6, 1896 when the St. Joseph Fire Department was called to help battle the Yore Opera House Fire in Benton Harbor. Soon after the firemen arrived in the alley behind the building with members of the Benton Harbor Fire Department, the entire back wall of the building collapsed, burying fifteen firemen under bricks and rubble. Twelve firemen succumbed to their injuries. Four of the firemen from St. Joseph are buried in City Cemetery: Edward Grange, Arthur Hill, Robert Rofe and Silas F. Watson. In 1898, a monument was erected on the bluff in St. Joseph and dedicated to the memory of all the lost firemen. The monument depicts a fireman holding a child in his arms and was created from the likenesses of St. Joseph Fireman Fred Alden and 5-year old Mabel Snyder. In 1946, a memorial was erected on the fireman’s lot in Crystal Springs Cemetery to honor the seven Benton Harbor Fireman lost that day. Ben also penned a poem about the Chicora, which was published in 1894, just before the boat was lost. The poem was entitled, “I Fed the Fishes”, which is actually a Nineteenth Century euphemism for being seasick.